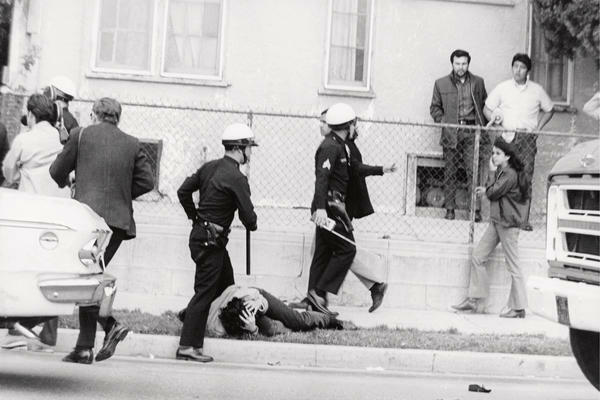 Los Angeles police arrest a Chicano student protester in the neighborhood of Boyle Heights in 1970. This image is seen on the cover to George Rodriguez's new book, Double Vision. 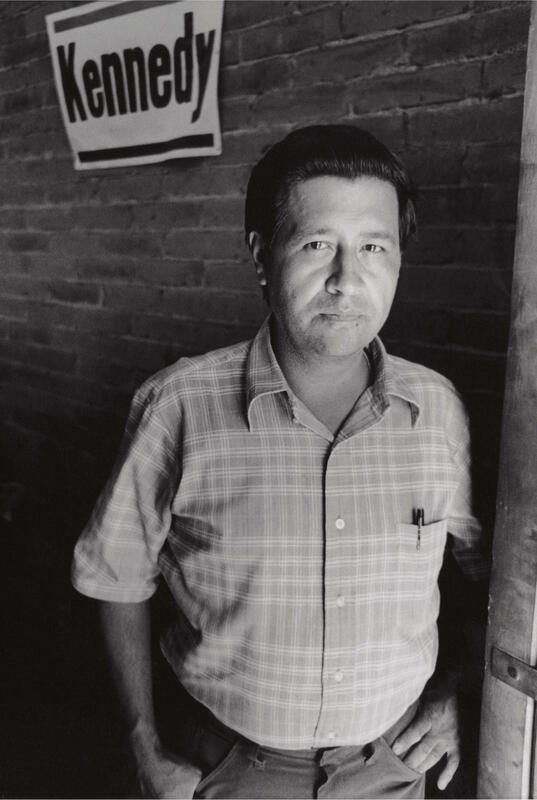 Rodriguez made this portrait of labor organizer Cesar Chavez in Delano in 1969. 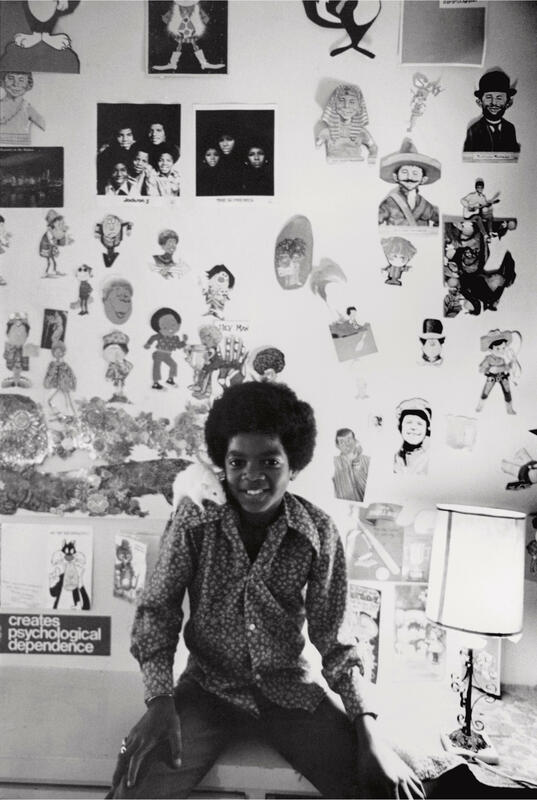 Michael Jackson sits in his room in his family's Encino, Calif., house in 1971. One of his two rats is perched on his shoulder. Rodriguez photographed rapper Eazy-E and his group N.W.A. in Burbank, Calif., in the 1980s. 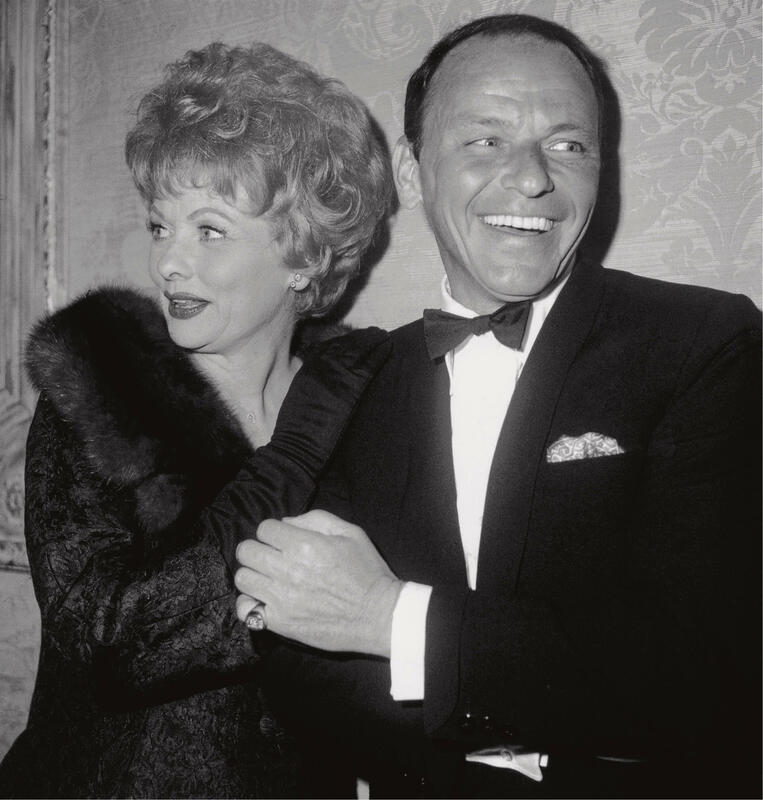 Rodriguez captured this candid of Lucille Ball and Frank Sinatra at the Screen Producers Guild Awards in 1962. 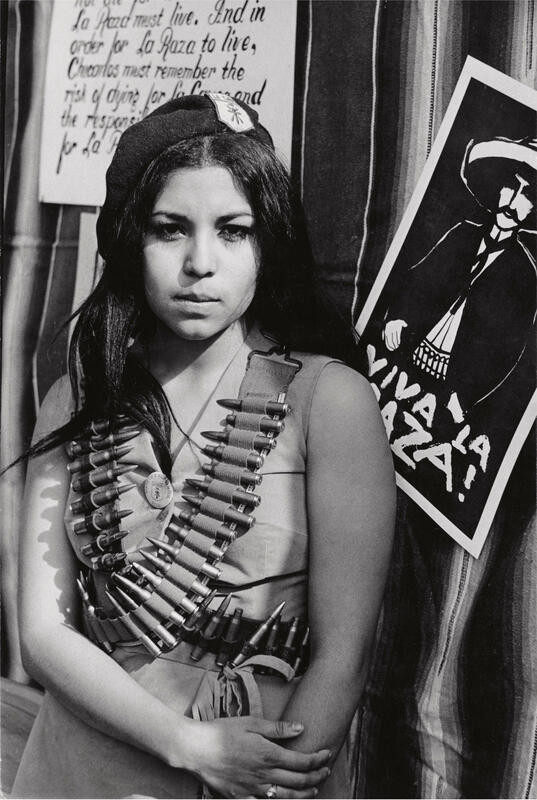 Rodriguez took this portrait of a Chicana demonstrator in the neighborhood of Lincoln Heights in 1969. 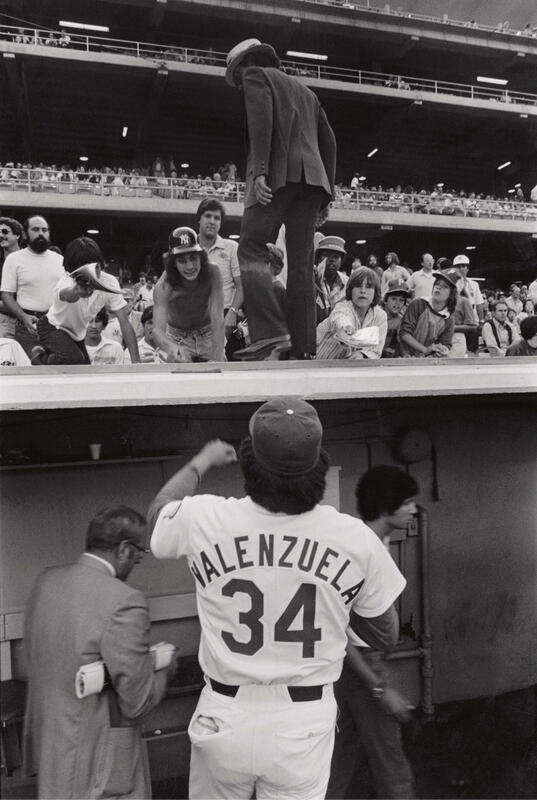 Pitcher Fernando Valenzuela enjoyed his breakout season with the Los Angeles Dodgers in 1981. 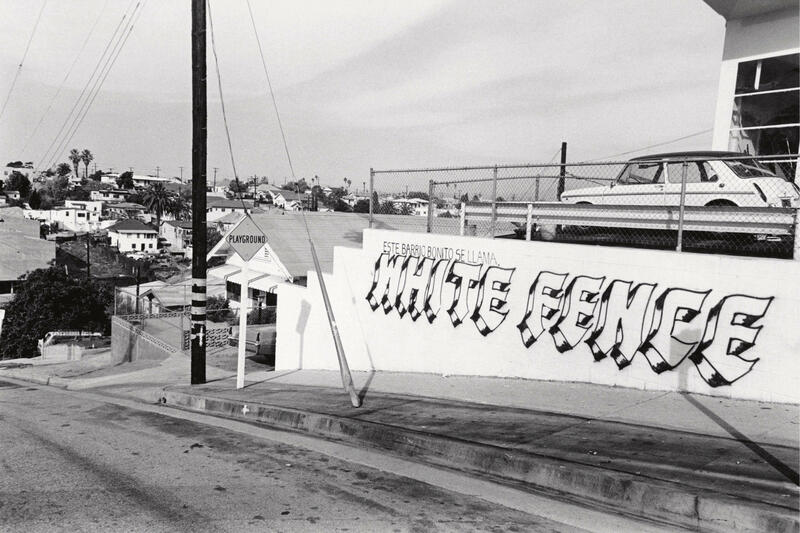 White Fence is a primarily Mexican-American gang in Eastside LA. Rodriguez says this 1960s tagging was whitewashed shortly after this photo was taken. 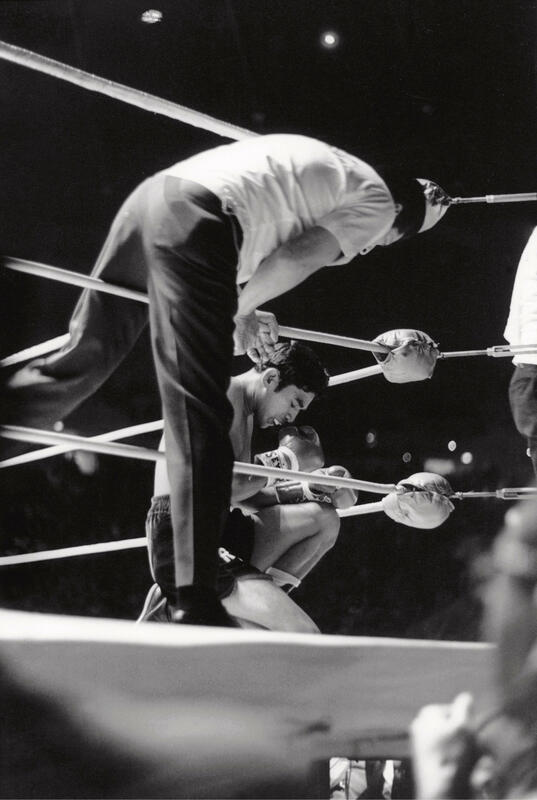 This capture of boxer Rubén Navarro, aka "The Maravilla Kid," was taken in 1968. 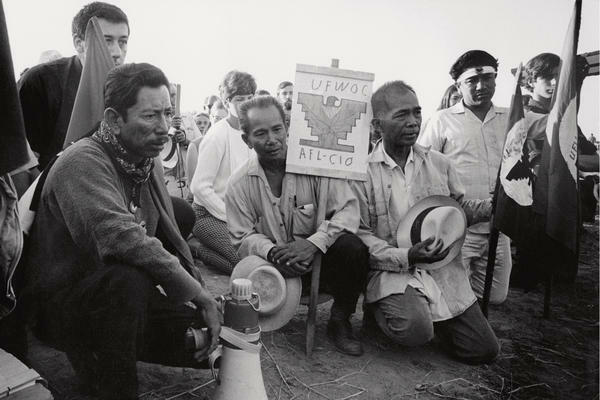 Rodriguez often documented agricultural workers' protests in the inland town of Delano, Calif. This photo was taken in 1969. In 1968, Chicano students staged walkouts to protest unequal conditions in Los Angeles public schools. Prior to this shot, a student was hit in the head by police officers. 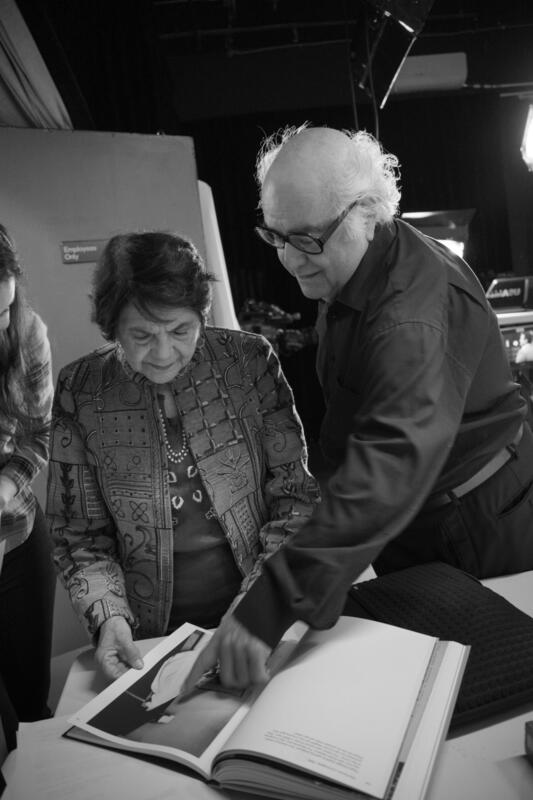 George Rodriguez shows an image in his book, Double Vision, to Dolores Huerta. 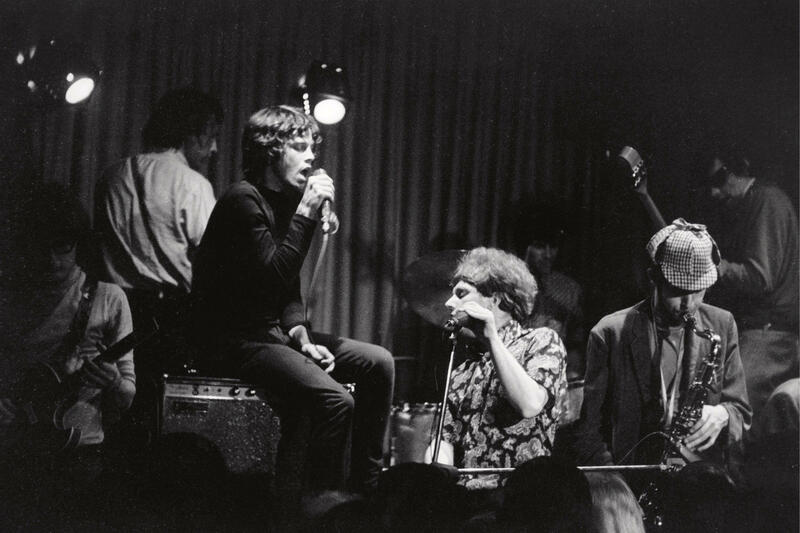 Jim Morrison, seated on an amplifier, sits in with the band Them at the Whisky a Go Go in 1966. Van Morrison (no relation) is at the keyboard. George Rodriguez, now 80, still doesn't go anywhere without taking pictures. "People don't recognize me without my camera," he says. "I like to document everything that's goin' on." For nearly six decades, the photographer has chronicled Los Angeles: Hollywood, the Chicano movement, hip-hop pioneers and beyond. His work is now being celebrated with his first retrospective, at the Lodge Gallery in Los Angeles, and a book called Double Vision: The Photography of George Rodriguez. Cultural historian Josh Kun, who edited the book, says the title refers to Rodriguez's varied subject matters. "The duality that emerged was his commitment to Chicano culture and Chicano social justice movements, and his equal commitment to documenting the worlds of Los Angeles celebrity and fame," Kun says. George Rodriguez grew up downtown near his dad's shoe repair shop in downtown LA's Skid Row. He picked up photography as a high school student in South Central LA — the same school that had, in the 1950s, graduated a number of doo-wop groups and Life magazine photographers he idolized. Rodriguez was still a teenager when he landed a job at Columbia Pictures in 1960. In the photo lab, he developed film for Hollywood photographers, who would get credentials to cover the openings of films such as Lawrence of Arabia and Breakfast at Tiffany's. "But they wouldn't go because it'd be kind of beneath them to go because they were shooting stars in their studios," Rodriguez recalls. "Somebody like that can't show up behind a rope on the red carpet. But I could." With borrowed credentials, Rodriguez went to splashy film premieres and awards shows. He took candid shots of Marilyn Monroe, Frank Sinatra, Lucille Ball, Natalie Wood and Warren Beatty. "My favorite thing is just taking pictures and people aren't aware," he says. "And you can get some incredible stuff." He adds that he tried to emulate those Life magazine photographers. "Those guys were taking pictures when other photographers are waiting for something to happen." As the '60s rolled along, Rodriguez decided to document what was happening on the other side of town. During his lunch breaks, he spent time in East LA, where high school students were walking out of their schools to protest discrimination. He captured images of Chicano demonstrators and police with batons. "Police departments had a field day," he says, even slipping into the present tense. "You know, the kids in the walkouts are just youngsters, like 14, 15 years old. They're not violent, they're not trying to hurt anybody, they're just trying to make a statement. But they're treated like criminals." 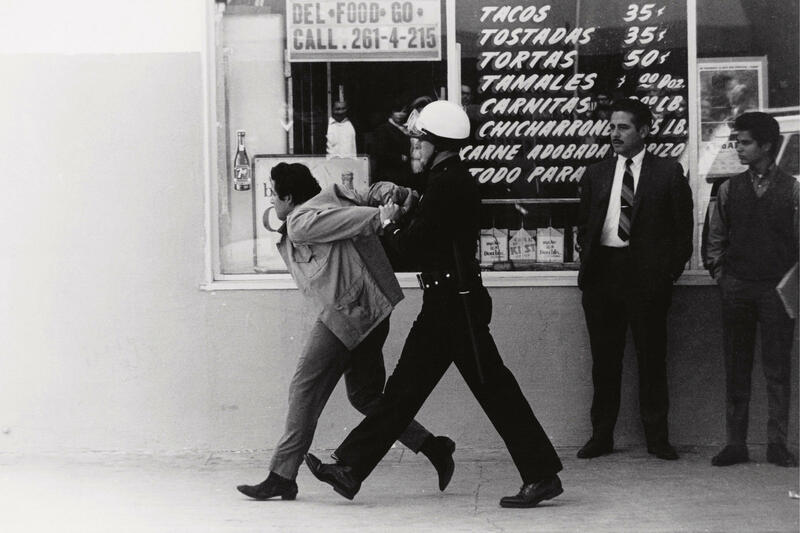 Rodriguez chronicled the Chicano Moratorium — the anti-Vietnam War demonstrations led by Mexican-American groups. And he also traveled north to Delano, Calif., to document farmworkers suffering miserable conditions. "They're picking grapes and they die in the fields," he says. "It still happens. The fight for the rights of farmworkers still goes on and on." Rodriguez spent years photographing protests, boycotts and hunger strikes by the United Farm Workers, led by the late Cesar Chavez and Dolores Huerta. The latter says they were grateful that Rodriguez's images inspired public support. "George was part of the movement himself," Huerta says. "He is Latino. He understood the culture. He understood the reasons why we did some of these things: the march to Sacramento, the strikes, Cesar's fasting. He was presente, as we say — present, in terms of being a justice fighter himself to end the discrimination ... we know that he maybe had a schizophrenic life because here he was photographing beautiful women in Hollywood and movie stars, and then he would come back to his world." That world included boxers, baseball players — and Michael Jackson. A Rodriguez photo is on the back of the first Jackson 5 album cover. Rodriguez photographed Diana Ross introducing the singing family at The Forum, and he visited them at home in Encino shortly after they moved from Gary, Ind. He has shots of Janet Jackson, just 5 years old; Michael shooting hoops with his brothers; and a young Michael sitting on his bed with a rat on his shoulder (after recording the song "Ben"). Rodriguez says he used to take his own brother Rudy to help him on the photo shoots. "We're talking to Michael [Jackson]," Rodriguez says, "and once he realized we were brothers, he asked me who could beat up who." He chuckles. "Here we are in our 30s! But you know, that's a kid question." The photographer also spent much of the 1960s hanging out with his camera at the music nightclub Whisky a Go Go on the Sunset Strip. He shot Jim Morrison and Jimi Hendrix onstage, and from there, he took publicity shots of Frank Zappa and album covers for Van Morrison and others. Though he's slowed down, Rodriguez still has a studio space with the Mexican American Legal Defense and Education Fund. There, his photos of civil rights leaders are mixed in with cover shots he took for Tiger Beat magazine. And he still keeps the graffiti-tagged backdrop he used to shoot portraits of the group N.W.A. The rappers look defiantly at his camera. "I just love these guys," Rodriguez says. "As it turned out, I realized that Dr. Dre went to my high school, Fremont High School in South Central. 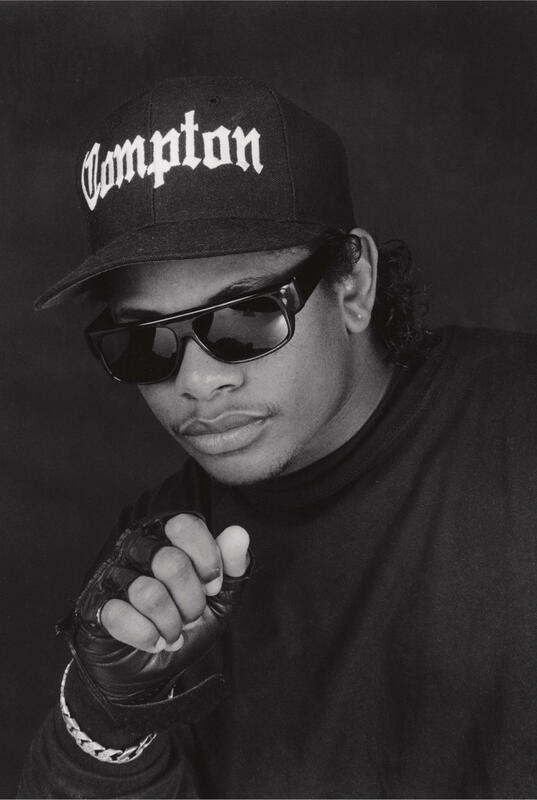 Eazy[-E] gave me four cassettes and it just blew me away. It was Straight Outta Compton. I loved it. It's still George Rodriguez's favorite — and only — rap cassette.